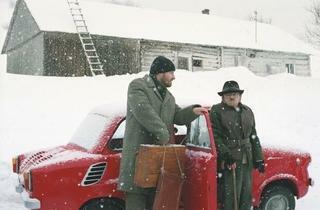 Set in the snowy spa town of Krynica, this multi-festival-award-winner paints a painstakingly sympathetic portrait of the last years and hours of the titular primitivist Polish ‘folk artist’, a lemko outcast who received some kind of recognition with a major exhibition and catalogue shortly before his death in 1968. As played (quite plausibly) by actress Krystyna Feldman, the diminuitive, tubercular, Hitler-moustachioed street artist had an irregular washing routine and a habit of referring to himself in the third person and turning up unannounced at people’s houses and setting up studio. 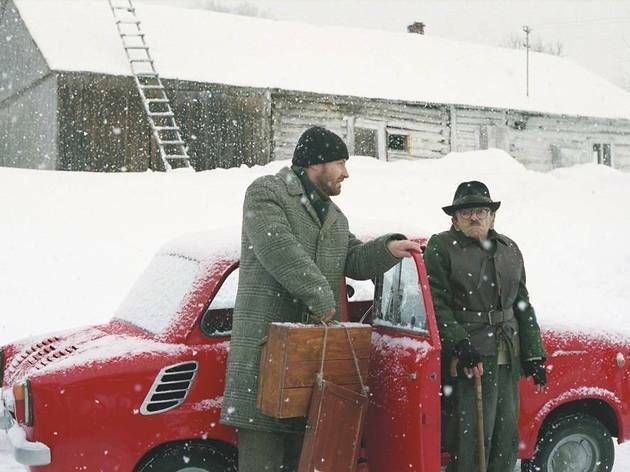 Krzysztof Krauze’s observational film has him pick on non-plussed state -sponsored ‘short-order artist’ Marian Wlosinski (empathetically played by Roman Gancarczyk), who soon sheds his wife and sweet pair of children through his developing loyalty to the old curmudgeon. The performances are solid and small points are made about the plight of outsider art and human bonding but as a study in dying or elderly eccentricity, it’s been eclipsed by recent works by Cristi Puiu and Paolo Sorrentino.